Let’s face it, we're halfway through the summer, but you’re 100% over having to shave your legs, armpits and bikini line every single week, right? You may have considered laser hair removal this year, but the upfront costs, fear of pain and typical hesitations to try something new got in the way. And now? Well, now, here you are – again – stubbly and in need of a good shave. Let’s not play the “shoulda coulda woulda game” and instead, take a look at the facts. With hindsight being 20/ 20, it’s time to learn how this may just be the ideal investment for the summers to come for perfectly smooth skin from head to toe. Yes, you are absolutely right that the initial expense of laser hair removal is more expensive than simply buying razors and shaving cream at the store, until you do the math. Depending on the area you are having treated, it will range in price from $89 to $2,000. For the smaller areas that need less work, such as your lip or armpit, a few sessions will most likely get you the results you were aiming for. For larger areas, such as full leg treatments, the usual expectation is 6 to 8 appointments. Still, the upfront expense is a fantastic investment when you consider the years of razor purchases or wax treatments. Though these seem less in the short term, they inevitably add up and drain your finances over time. 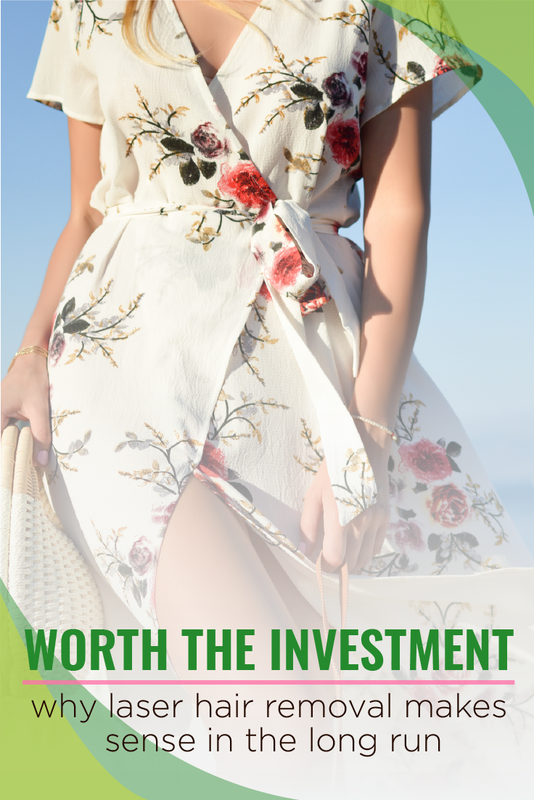 Of course, your money is incredibly important and is a huge factor to consider when investing in laser hair removal but so is your time. If there is one thing you can’t ever get back or make more of, it is your precious time, and who wants to waste that in the shower, cutting into your leg and missing patches of hair anyway? Instead, with a handful of 20-40 minute sessions, you will be hair free and ready to go- never having to worry if your stubble is about to cause you trouble. Check Out Our Laser Hair Removal Prices! We think it’s safe to say that at least every woman in her lifetime has experienced the dreaded “leg slip.” And as if skinning your leg with your razor isn’t enough to turn you off from shaving for good, the inevitable nicks, rashes, ingrown hairs and razor burns certainly are. The typical culprit of these hairy situations tends to be a dull razor- overworked and ready to be discarded. Not only can an old razor cause you to cut your skin, but it can be the reason behind your razor burn and rash- specifically along your bikini region. The beauty behind laser hair removal is in eliminating the risk of these shower time conundrums, while destroying the hair follicles themselves, ensuring your hair doesn’t grow back and ingrown hairs are a thing of the past. At Anew You, we understand that you have hesitations and sometimes they cause you to pass up great opportunities. But can we both agree- midway through summer and now cursing your razor- you probably should have looked more into laser hair removal? The good news is: it’s never too late to get started and smoother skin is only a few sessions away. Remember, laser hair removal today, break up with your razor for good, tomorrow! Say goodbye to the razors for good! We'll be in contact soon! Older PostAm I a CoolSculpting Candidate?